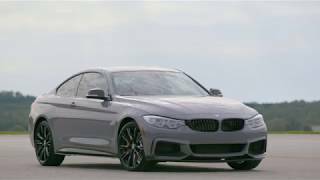 BMW has revealed the new 4-Series coupe with M Performance accessories which will have its premiere at the 2013 Frankfurt Motor Show in September. M Performance parts are developed from motor racing expertise and the parts are perfectly tailored to the specific models and engineered according to individual preference. The BMW 4-Series Coupe M Performance Parts sports a deeper front bumper with fiber splitter, large air ducts, a black radiator grid for the grille, a diffuser insert for the rear apron, side sill foils, mirror caps and a rear spoiler. All this optimize the coupe’s sporty appearance and aerodynamic properties. Another new feature in the BMW M Performance range is the 18-inch winter complete wheel sets in double-spoke design. The interior is inspired by BMW M Performance sports steering wheel with red central marking or Race Display. The gear lever and handbrake handle come in carbon including Alcantara gaiter. 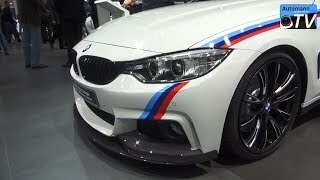 In addition, interior strips in carbon and Alcantara, high-grade steel pedals, a specially designed driver footrest and BMW M Performance floor mats are also available. On the performance side, the BMW 420d is powered by the 2.0-liter 4-cylinder turbocharged diesel engine and with M Performance parts the power output is increased by 16bhp and torque by 39 Nm. Power and torque for the 428i is enhanced to 269bhp and 389 Nm respectively, with an additive 27bhp and 39 Nm. 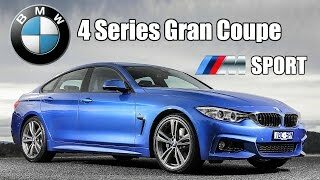 With the M Performance package the BMW 435i which is powered by the 3.0-liter 6-cylinder turbocharged engine also registers an increase of power and torque by 34bhp and 50 Nm, developing 336bhp and 450 Nm.